While many appetizing descriptors come to mind, suffice to say this incredible mound of meat is worth every dollar, no matter how many more dollars it seems to command these days. 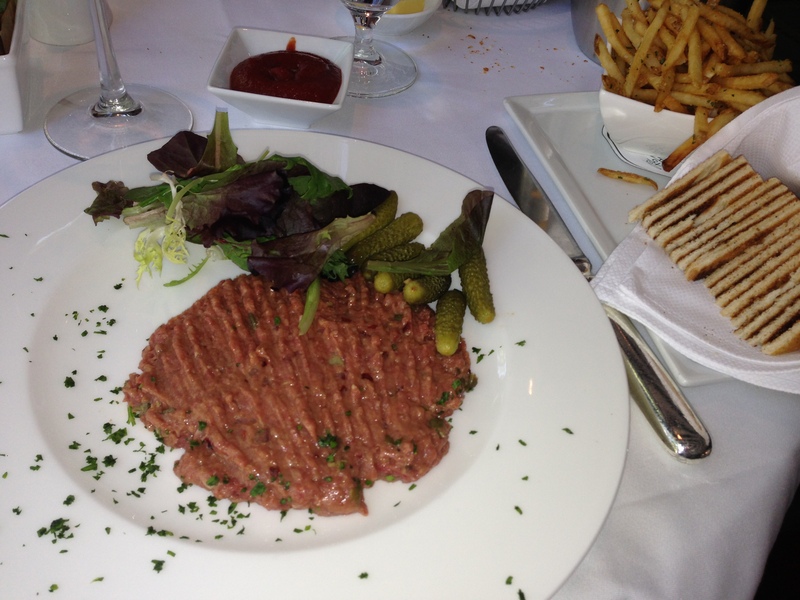 There’s no substitution for steak tartare at the Polo Lounge. A true indulgence it continues to be! Considering the more-than-generous portions at less-than-outrageous prices, with soup and salad courses included, alongside classicly well-poured libations, altogether it might just be the best deal in town. After almost 60 years, this special dining spot clearly has it all down to a T.
There’s always a first time, and in this case it’s bacon and ahi tuna in the same bite. These two distinct yet divergent ingredients lay the foundation for the single most delicious sandwich I’ve eaten in recent memory, if not ever! Such a successful contrast of flavors really is like no other. The menu wording reads quite simply: “Seared rare ahi tuna with avocado, grilled pineapple, bacon, red onion, island slaw and greens with wasabi aioli on toasted sourdough.” What arrives before you: Absolute bliss. The ahi tuna club at Boathouse at Hendry’s Beach wastes no time in proving itself a unique and delightful experience on the palate. Then with the addition of a blackberry mai-tai, the deal’s done. This meal “seared” itself into my discerning culinary memory. Needless to say, a repeat sitting can’t come too soon. May your own “taste” meet mine. You’re in good company here. Meanwhile, service proved consistent and attentive, once the transition from bland bartendress to talkative table server was complete. The history is on the wall– literally– and with so many decades of photos and other classic decor to take in, an entire afternoon of “indulgence” seems perfectly reasonable. The copious cocktails runneth over, as well they should– and in this delightfully old-school, red-boothed establishment always do. And when the time finally comes, the robust coffee will have prepared you for your exit quite comfortably, as of course it did for yours truly, dessert notwithstanding. Despite minor forgivable hiccups during a crowded dinner hour, my first visit can be considered a success. I’m confident my imminent second trip to Harry’s Plaza Cafe will be even better. Join me anytime for a bite and sip, assuming you can locate this discreetly situated local hideaway. One Sure Palate Pleaser. Or Two. Call it a classic dish that never gets old, in an old establishment that’s never been more classic. At least this is how I think of it. And by virtue of the fact my favorite mouth-watering culinary creation– custom prepared tableside of course– famously stands the test of time on an ever-changing menu, my selection has been made well before I’ve arrived and sat down. A raw hamburger patty this is not, yet raw it is. Ordinary it’s never been, nor boring it ever will be. In this case there are no others, as my longstanding indulgence shall remain so. The next time you’re near The Beverly Hills Hotel while feeling the distinct onset of carnivorous adventure– or even if you’re cities away and need to schedule a special trip as I did– drop into the Polo Lounge for the steak tartare. One sure palate pleaser it is, ready to satisfy any discerning red meat-based taste buds. It’s even better, I shall go so far to say, than Paradise Cove’s scrumptious seafood burger, a uniquely robust compilation of surprisingly flavorful sea meat in the form of a soft, perfectly cooked patty. But this is another story altogether; apples and oranges if you will, though easily another sure palate pleaser of superior standing. Altogether, yet again from one part of town to another, our food bases remain well covered! You might get right on over to Malibu for a more casual early dinner after that tartare lunch has settled!